Thanks to a tip, we took a look at the playground for Anne Frank Elementary in Dallas, Texas via satellite image, where a rather large cell phone tower looms over the public school campus. The very place that these young children (and their teachers) spend their time – both inside and outside the school building – is saturated with powerful electromagnetic frequency radiation. This is unconscionable. How is this even allowed? 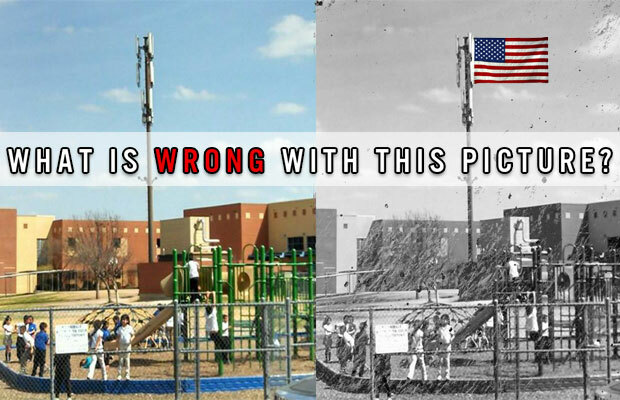 To have a giant cell phone tower standing in the middle of an elementary school right on the basketball court directly between the playground where small children with developing brains are playing and the buildings they are supposed to be learning in every day on this public school campus? HOW ARE THEY GETTING AWAY WITH DOING THIS?! And how many other schools are doing this to their students across America? Considering that numerous studies have linked cell phone radiation with cancers including leukemia and brain tumors – and that studies have found young children to be more susceptible to damage from EMF fields, allowing a cell tower to operate right in the middle of an elementary school campus seems particularly flagrant and unwise. Yet no one put two-and-two together and considered that if the radio frequency fields were hazardous to humans, that school children don’t belong in their proximity. Wow! How many other locations in society is this technology also posing a risk to human health? There are enough scientific studies to make clear to anyone paying attention that there is a problem… but of course, the long term effects are yet unknown. Estimates show that those of us living in modern-day America are experiencing 100,000,000 times more electromagnetic frequency (EMF) than our grandparents did simply by existing. Incidents of brain tumors have also been found to be higher in Western, developed nations. Everything from cell phones to cell towers going up everywhere to household appliances to computers…even cars emit EMF. Many of these technologies were never tested for potential harmful effects. Research has found EMF does have an adverse effect on tissues and cells, and this non-ionizing radiation has been classified as a carcinogen or potential carcinogen. The top two childhood cancers are leukemia and cancers of the brain and nervous system. Studies have linked both EMF exposure and childhood leukemia (for a few examples, see here, here, here and here), and EMF exposure to childhood brain tumors (see here, here and here). Belgium just banned cell phones specifically designed for children up to age 7 based on this risk. 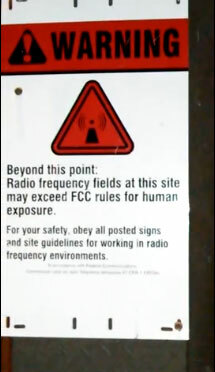 That this caused the commission to conclude, “We strongly advise limited use of cell phones, and other similar devices, by young children and teenagers, and we call upon governments to apply the Precautionary Principle as an interim measure while more biologically relevant standards are developed to protect against, not only the absorption of electromagnetic energy by the head, but also adverse effects of the signals on biochemistry, physiology and electrical biorhythms”? Also, the Cellular Phone Task Force compiled a list of all the governments and advocacy organization on record warning against or even banning wireless technology (see here). 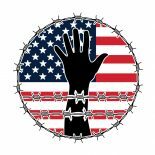 This entry was posted on January 11, 2015 by conspiracyanalyst in Health & Wellness, Radiation, US News and tagged brain tumors, cell phone towers, cell phones.